This is so ironic, considering … uh, history. Now, crashing into the consciousness of the whole country, is the realization that other forces have been at work here, the narratives of bigotry that many of us assumed were vestigial relics of a shameful past. The virus of white supremacy, it turns out, is in no way atrophying, nor is it confined to Britain, Europe, the USA — its more obvious sites of recent replication. It is here too, proliferating in a petri dish of immigrant angst, resentment at Maori progress, and mistrust of the foreign. Do we summon our better angels of love and empathy only after damage has been done? Every mass shooting signals deep, unaddressed flaws in the social structure. The “colonial forces” that began remaking the whole planet some 500 years ago remain essentially in charge; certainly they do in this country, which has assumed global leadership in outmoded — i.e., military — thinking … and spending. Last year’s U.S. defense budget was $716 billion (with Donald Trump, the “invasion” trumpeter in chief, requesting a $34 billion jump in that figure for 2019). This is indicative of government fully committed to the idea that much of the world is its enemy. As long as the country itself is committed to waging war, a segment of the population will be as well. This means reorienting our foreign affairs to focus on diplomacy and economic and cultural engagement. At a time when we spend more on our military than the next seven countries combined, our global armed presence is often the most immediate contact people in the developing world have with the United States. 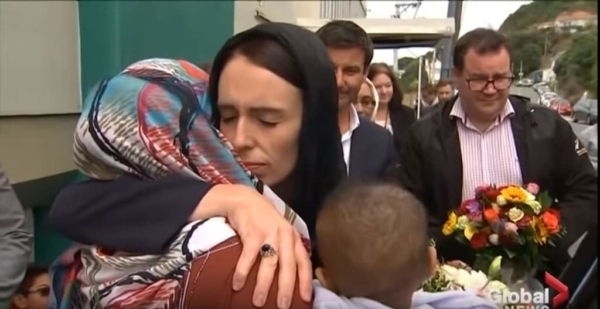 Image: Screenshot from Youtube: “New Zealand shooting: PM Jacinda Ardern lays wreath at mosque, embraces mourners of Christchurch,” by Global News.